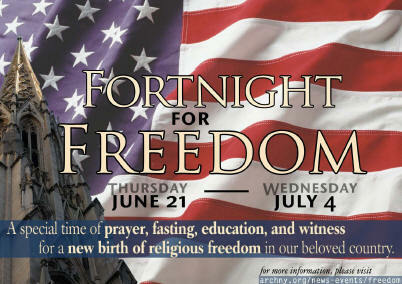 Masses, holy hours, Eucharistic processions, rallies, concerts, and lectures are among the activities planned by various dioceses as part of the Fortnight for Freedom campaign announced by US bishops in April. The campaign will begin on June 21 with a Mass celebrated by Archbishop William Lori of Baltimore and conclude on July 4 with Mass at the Basilica of the National Shrine of the Immaculate Conception in Washington. "Culminating on Independence Day, this special period of prayer, study, catechesis, and public action would emphasize both our Christian and American heritage of liberty," the bishops’ Ad Hoc Committee for Religious Liberty said in April upon announcing the campaign. "Dioceses and parishes around the country could choose a date in that period for special events that would constitute a great national campaign of teaching and witness for religious liberty."